Have you seen me lately? A tale of composite and synthetic decking evolution. 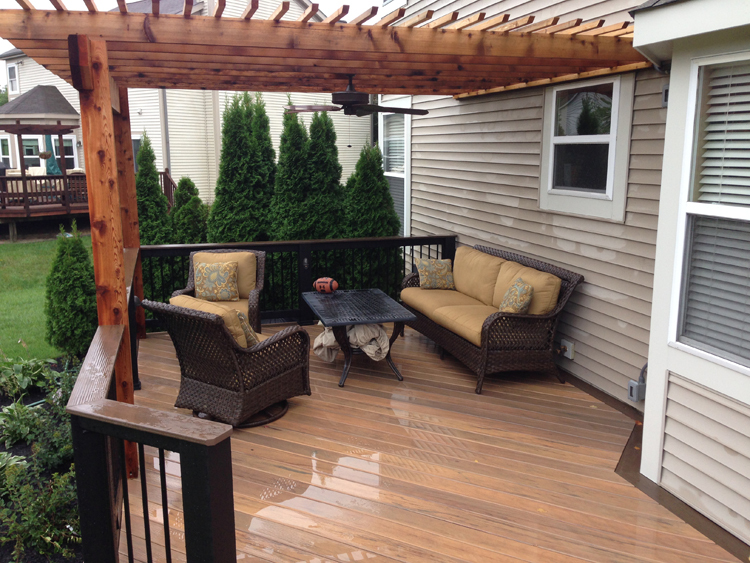 It’s easy to love the low maintenance and incredible durability of synthetic wood products. No pressure treated pine on earth comes with the kind of stain, fade, and scratch warranties offered by companies like TimberTech and AZEK. When people choose wood over synthetics, it is usually for one of two reasons. The first is price. Synthetics cost more initially, although if you figure in the long-term costs of owning your Columbus porch or deck, the total price to own is very competitive. The second reason is the look of synthetics: they don’t look like “real” wood… or do they? In the early days of synthetic timber, decks and porches made with synthetic products had some flaws and looking like plastic was one of them. Now that the industry and its products are more mature, most of the design shortcomings of composite and PVC products have been engineered away. Take the VertiGrain™ innovation from TimberTech as an example. Each board has textures, color, and streaking that make it unique. How does TimberTech achieve this one-of-a-kind look for each plank coming off its production line? Similar products attempt to recreate a “V” shaped sawn lumber pattern by embossing or other methods that can look a little “cookie cutter.” VertiGrain™ emulates the look of top-quality vertical grain lumber: no two pieces are alike in their simulated wood grain. You won’t see any repetitive patterns on your deck. Customers can see VertiGrain™ in action in all of the boards in the Legacy and Tropical series by TimberTech. Hidden fasteners are available in those lines as well for a sleek, streamlined look. Another method for making each board unique is the trend toward bringing hand-scraping from the interior of the home to outdoor living spaces. In addition to giving the boards additional variety in texture, hand scraping allows you to feel grooves in the wood at a variety of lengths and depths. Hand scraping is a trend that has been with us for a while and it seems to be growing more and more popular. I see it in hundreds of homes each year. With synthetics, you don’t really need to worry about damage from pets and kids, but this distressing takes that protection to the next level. I’m often asked about how slippery synthetic plank floors are when they get wet. Fully plastic boards, including capped composites and PVC, take a little longer to dry, but are not any more difficult to walk on safely when wet than traditional wood. They are also remarkably easy to squeegee off, if you like, and that will speed up the drying process. When it comes to ice and snow, things will always be treacherous, regardless of the type of flooring you choose. Step carefully! Author archadeckofcolumbusPosted on August 5, 2015 August 5, 2015 Categories Composite decks, TimbertechLeave a comment on Have you seen me lately? 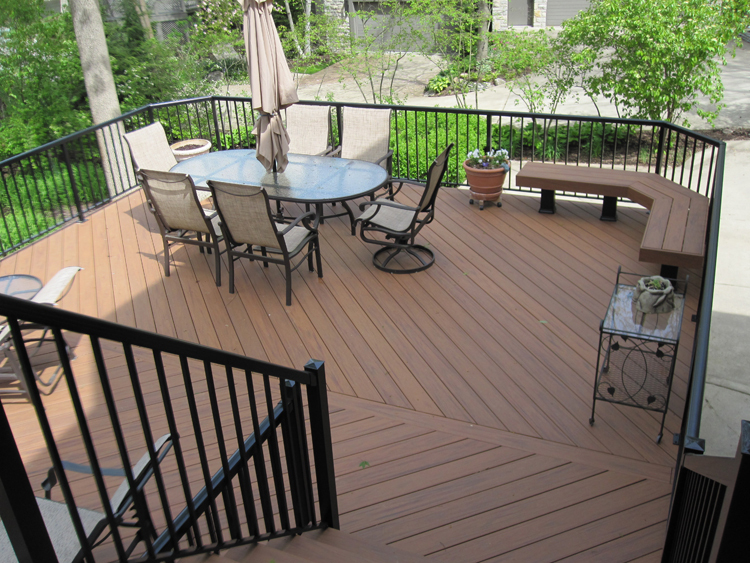 A tale of composite and synthetic decking evolution.